Israel needs the Diaspora as surely as the Diaspora needs Israel. Accompanied by Rabbi Israel Meir Rau, Rabbi Emanuel Feldman carries one of Beth Jacob’s Torahs from Heritage Hall to the new sanctuary. From the Kotel to conversions, conflict too often seems to be the standard state between Israel and the Diaspora recently, and that’s without delving into rifts over the Palestinians. So the joy of Congregation Beth Jacob’s sanctuary unveiling Sunday, July 9, was lifted even higher by the unrestrained celebration of Israel-Diaspora connections and coexistence. The ceremony dedicating the renovated sanctuary featured two Israeli rabbis: Emanuel Feldman, the spiritual leader of Beth Jacob for 40 years until making aliyah a quarter-century ago, and Israel Meir Lau, the former Ashkenazi chief rabbi of Israel. 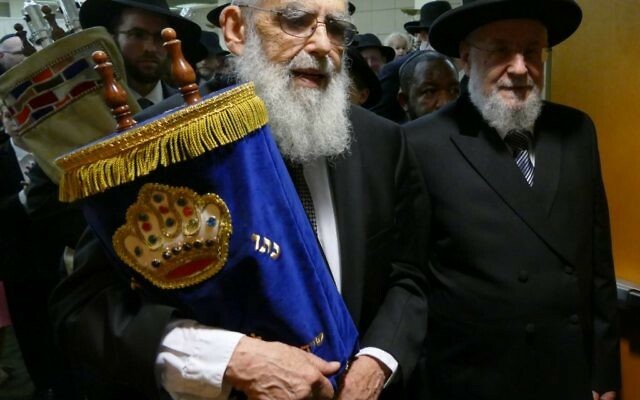 They brought warmth, wisdom and, above all, love from the Jewish homeland to one of the outstanding outposts of Orthodoxy in America — one that wouldn’t exist without the work Rabbi Feldman began 65 years ago when he arrived in Atlanta at age 24 or without the strong ties Beth Jacob has maintained to Israel over the decades. 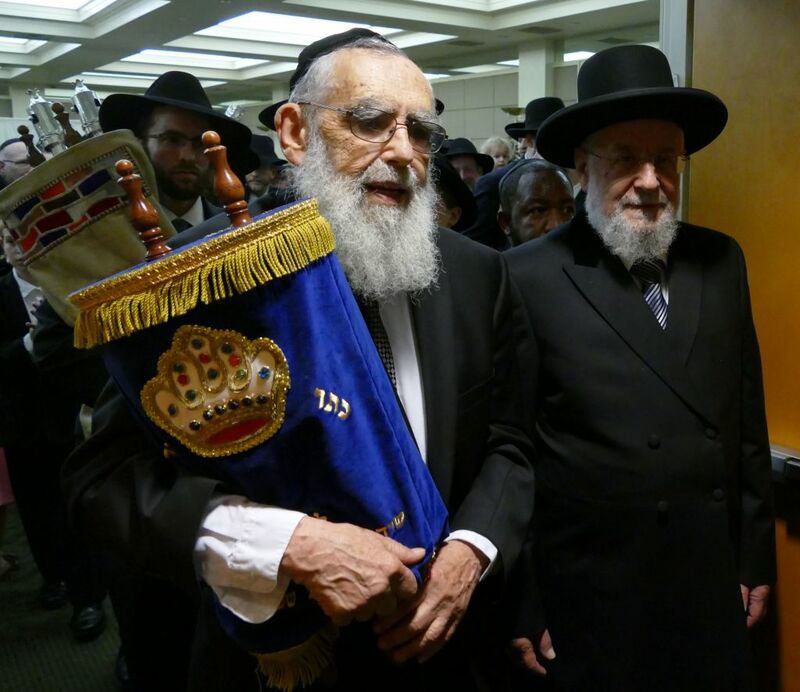 Both Rabbi Feldman and Rabbi Lau are treasures, and the turnout reflected the recognition that getting to see and hear them together was a special treat for Jewish Atlanta, regardless of the occasion. But we are also grateful to Rabbi Feldman’s son and successor, Rabbi Ilan Feldman, for emphasizing the importance of the Diaspora in his remarks. Rabbi Feldman told of an unsuccessful fundraising conversation with a couple during the capital campaign for Beth Jacob’s upgrades. The couple questioned the wisdom of pouring money into a building in Atlanta when our hope, prayer and expectation is that the Messiah will lead us all back to Israel. If we’re sincere in our beliefs, isn’t shul beautification a waste of resources? Rabbi Feldman explained that we Jews weren’t scattered to every corner of the world just as a punishment or as a way to bide our time while awaiting the Messiah. Instead, we’re on a mission to make the world a better, holier, more just place. It’s a mission we tried to carry out by setting an isolated example, but that approach didn’t work. So we’ve spent the past 2,000 years bringing our example and the Torah’s lessons to people where they live. Thus, we in the Diaspora play a vital role in conjunction with our fellow Jews in Israel in uplifting the world to prepare for the messianic age. It’s a spiritual message that has echoes throughout the relationship between Israel and the Diaspora. In a world in which anti-Semitism has found an acceptable outlet as hatred of Israel, the Jewish state needs Jews around the world to challenge unfair, disproportionate criticism. If America had no Jews to educate them, would friends such as Nikki Haley, the U.S. ambassador to the United Nations, be as vocal in their defense of Israel? At the same time, where would we be in the struggle for Jewish continuity in most of the Diaspora without Israel as a place for our children to develop a sense of peoplehood and without the aid of Israel’s emissaries and funding. The bottom line: Israel needs the Diaspora as surely as the Diaspora needs Israel. Either might be able to survive without the other, but both are stronger and more successful together.